Samsung is offering a new series of All-In-One PCs that will give you enough power, encased in compact and elegant design, appropriate for the limited space in office or your home. The Series 7 AIO are fitted with 23-inch (1920 x 1080) LED backlit touchscreen with 250 nits of brightness which is only 16mm thin and can be tilted horizontally, creating a full horizontal touch interface. Inside, you’ll find Intel Core i3/i5 processors, up to 8GB of RAM, a 1TB 7200RPM hard drive, and Gigabit Ethernet, 802.11 b/g/n WiFi, and Bluetooth 3.0 connectivity. Series 7 also include Harman Speakers(2x4W), powered by the SoundAlive sound enhancer, for better audio experience, 1.3MP HD webcam, DVD player, as well as USB 2.0/3.0 ports. The Series 7 All-In-One comes with Windows 7 Home Premium operating system, paired with Samsung Touch Launcher software, providing touch-based access to your favorite applications from the desktop. 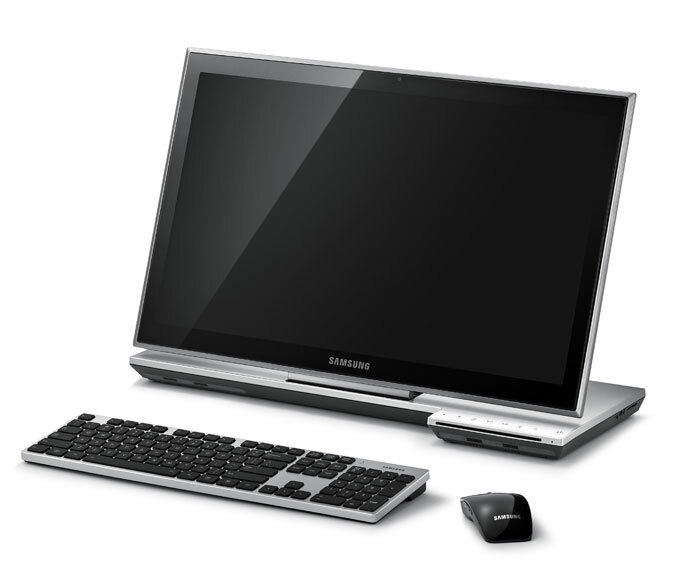 Samsung’s Series 7 All-In-One PCs will be available starting October 10 with prices rangingfrom $999 – $1,199.